I will fight anyone who does not love Jon Ronson. 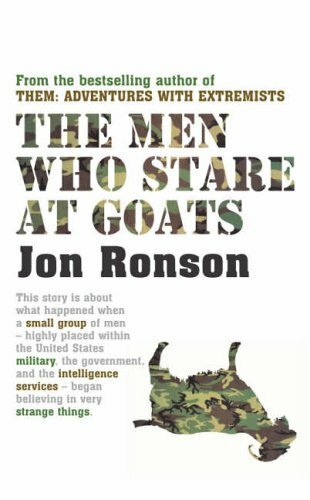 With that out of the way, I thought that The Men Who Stare at Goats might make a good palette cleanser after all the girly time travelling my reading's been doing recently. And it does. It's only a short book - three train trips from my house to the city and it was gone - but there's a lot of information in it. After the Second World War, the American army became more open to trying to new techniques to, well, control the physical and mental chemistry of its own soldiers and the enemy's soldiers in an attempt to either prevent a war or win one, depending on who was in charge of the military programmes at the time. Experiments included, but were not limited to, staring at goats and other animals to try to remotely stop their hearts, playing discordant sounds and music at the enemy to disrupt brainwaves, hypnotism, the administration of LSD, and so on. Some of these tactics are still in use. Some are credited with limited success while others are openly laughed at for several years, yet resurrected periodically when a new wave of commanders tries to revamp the army and its image. Jon Ronson is a good journalist to have working on such a project. He is open and willing to be convinced, but not gullible. He is sceptical and grounded in reality, but not sneering and cynical. He doesn't reallly seem to have an agenda except to find out what's going on, maybe tell a few funny anecdotes along the way, but mostly get to the bottom of an interesting question. As an atheist, though, it is refreshing to see someone make the link between the New Age hippy practices of spoon bending and remote thinking and mass prayer meetings. Yes, it's pretty stupid to think that you can stop a goat's heart from the next room just by staring at it. Is it any stupider than thinking you can influence some deity in the sky to make the Iraqis surrender? I was also interested in the stories of collateral damage, of what happens when the easily influenced come into contact with military "experts" feeding them "facts" (step forward the Heaven's Gate crew, remember them?) and when people on the inside of these projects decide they want to get out. I'm not sure I'd recommend it to any ofyour paranoid friends though. If you think they were bad after reading Them, you won't want to go drinking with them after reading this.